Wat is dit voor site? Wij zoeken de goedkoopste boeken op internet. Recreation, Event and Tourism Businessesvonden we het goedkoopst op Bol.com voor €0. We hebben gezocht in nieuwe en tweedehands boeken. Rechtsonderaan de pagina kan je het boek direct bestellen	via Bol	.com. This book uncovers the keys to business success in the commercial recreation, event and tourism sector, one of the fastest-growing segments in the tourism and recreation industry. Until now, students, professors and professionals interested in this growing industry have been limited to general business or basic recreation texts. 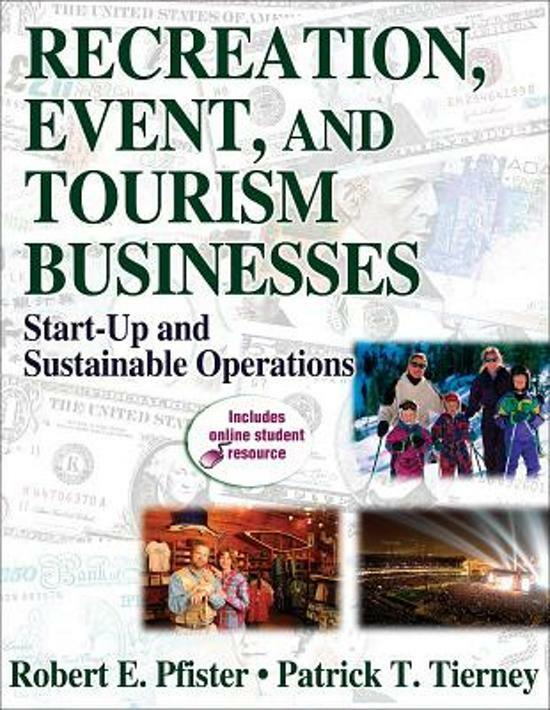 Written from both entrepreneurial and operations management perspectives, the book provides a practical overview of the recreation, event and tourism (RET) field and the business planning process. A new conceptual model of the RET industry is presented and related to existing models. It explains how the industry works and examines the key components of commercial RET businesses. The book also describes how companies are started, operated and managed, including information on service issues, risk management, finance and marketing. It provides examples of how RET businesses can be operated in a more sustainable, environmentally friendly manner.It provides students with practical business concepts and content that link to the core principles of the RET field so they'll be professionally prepared to deliver appropriate services. They'll explore contemporary management practices while discovering the diverse career opportunities available in the RET industry. A comprehensive view of the industry is provided, offering new insights for current practitioners and thorough preparation for students seeking careers in the recreation, event and tourism industry.